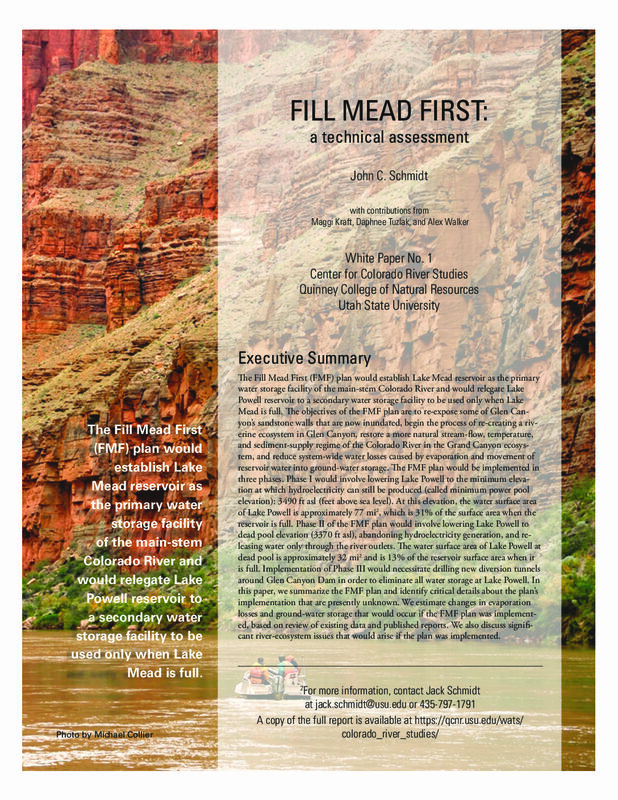 The Fill Mead First (FMF) plan would establish Lake Mead reservoir as the primary water storage facility of the main-stem Colorado River and would relegate Lake Powell reservoir to a secondary water storage facility to be used only when Lake Mead is full. The objectives of the FMF plan are to re-expose some of Glen Canyon’s sandstone walls that are now inundated, begin the process of re-creating a riverine ecosystem in Glen Canyon, restore a more natural stream-flow, temperature, and sediment-supply regime of the Colorado River in the Grand Canyon ecosystem, and reduce system-wide water losses caused by evaporation and movement of reservoir water into ground-water storage. The FMF plan would be implemented in three phases. Phase I would involve lowering Lake Powell to the minimum elevation at which hydroelectricity can still be produced (called minimum power pool elevation): 3490 ft asl (feet above sea level). At this elevation, the water surface area of Lake Powell is approximately 77 mi2, which is 31% of the surface area when the reservoir is full. Phase II of the FMF plan would involve lowering Lake Powell to dead pool elevation (3370 ft asl), abandoning hydroelectricity generation, and releasing water only through the river outlets. The water surface area of Lake Powell at dead pool is approximately 32 mi2 and is 13% of the reservoir surface area when it is full. Implementation of Phase III would necessitate drilling new diversion tunnels around Glen Canyon Dam in order to eliminate all water storage at Lake Powell. In this paper, we summarize the FMF plan and identify critical details about the plan’s implementation that are presently unknown. We estimate changes in evaporation losses and ground-water storage that would occur if the FMF plan was implemented, based on review of existing data and published reports. We also discuss significant river-ecosystem issues that would arise if the plan was implemented. 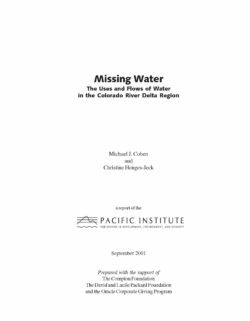 The Pacific Institute for Studies in Development, Environment, and Security is pleased to announce the release of Missing Water: The Uses and Flows of Water in the Colorado River Delta Region. 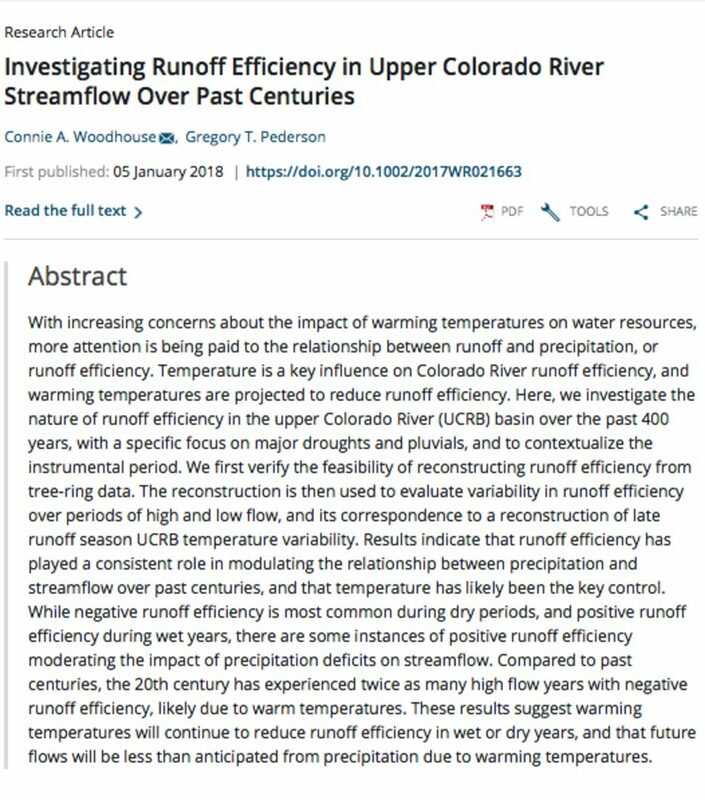 This new study describes the fate of the millions of acre-feet of water diverted from the Colorado River at and below Imperial Dam, and the total inflows to and outflows from the Colorado River delta region more generally. 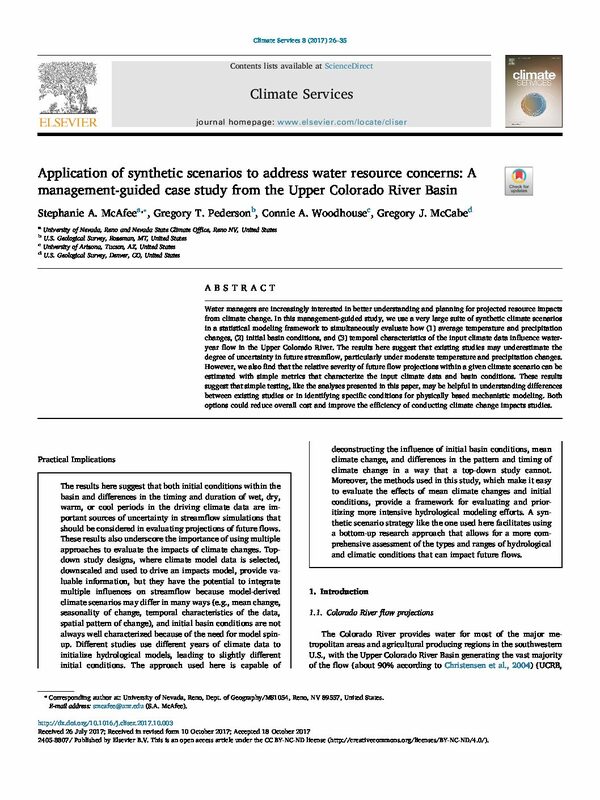 This study uses the classic hydrologic boundaries of the delta region described by Godfrey Sykes in 1937, encompassing some 3,325 square miles (8,611 square kilometers) in the states of Arizona, Baja California, California, and Sonora, including the Imperial, Mexicali, and San Luis valleys, Yuma Project lands, and the lower Coachella Valley. The study period examines the flows and uses of water in the years 1991-1998, divided into Flood and Non-Flood years to reflect the tremendous variability of mainstem Colorado River flows. Missing Water compiles flow data along the mainstem and along diversions within the delta region, the first time such data has been compiled for the region as a whole. The study also report consumptive uses of water in the agricultural and urban sectors, and estimates such use by the environment. Agricultural use is also reported for the major crops in the region, both by acreage and by water use. Between 2000 and 2014, annual Colorado River flows averaged 19% below the 1906–1999 average, the worst 15‐year drought on record. At least one‐sixth to one‐half (average at one‐third) of this loss is due to unprecedented temperatures (0.9°C above the 1906–1999 average), confirming model‐based analysis that continued warming will likely further reduce flows. 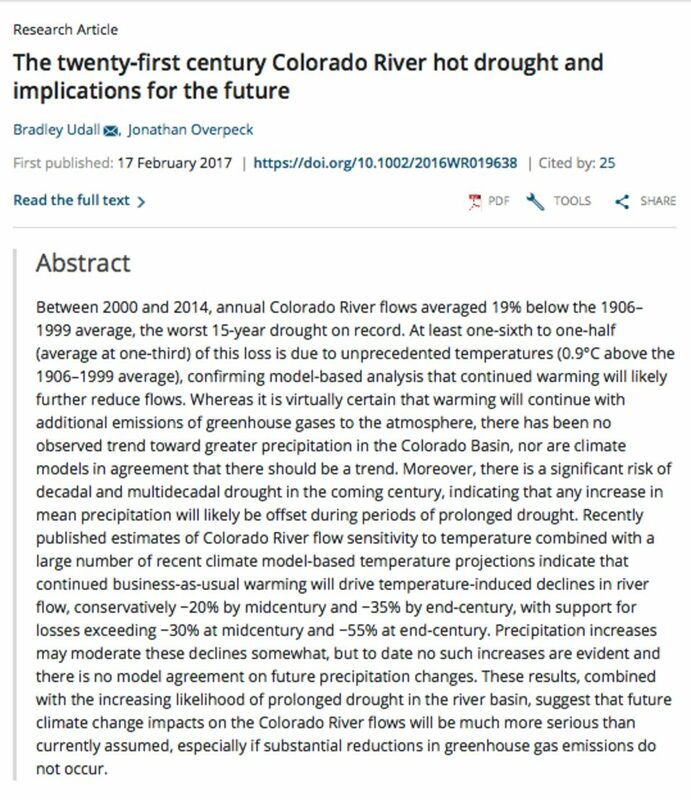 Whereas it is virtually certain that warming will continue with additional emissions of greenhouse gases to the atmosphere, there has been no observed trend toward greater precipitation in the Colorado Basin, nor are climate models in agreement that there should be a trend. Moreover, there is a significant risk of decadal and multidecadal drought in the coming century, indicating that any increase in mean precipitation will likely be offset during periods of prolonged drought. 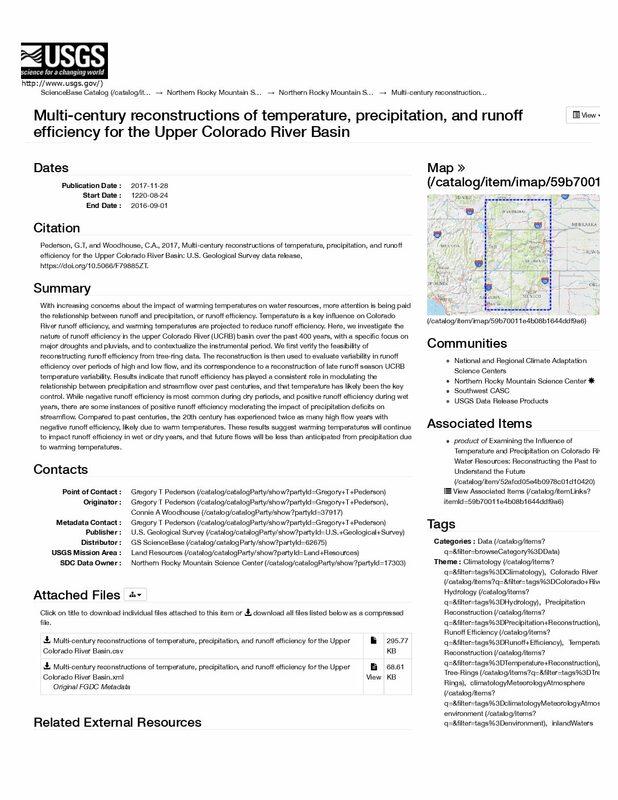 Recently published estimates of Colorado River flow sensitivity to temperature combined with a large number of recent climate model‐based temperature projections indicate that continued business‐as‐usual warming will drive temperature‐induced declines in river flow, conservatively −20% by midcentury and −35% by end‐century, with support for losses exceeding −30% at midcentury and −55% at end‐century. Precipitation increases may moderate these declines somewhat, but to date no such increases are evident and there is no model agreement on future precipitation changes. 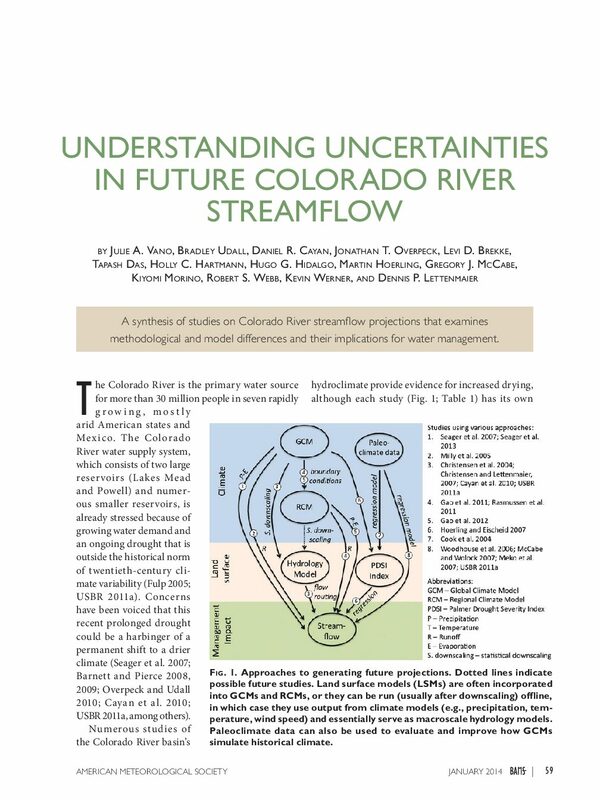 These results, combined with the increasing likelihood of prolonged drought in the river basin, suggest that future climate change impacts on the Colorado River flows will be much more serious than currently assumed, especially if substantial reductions in greenhouse gas emissions do not occur. The International Boundary and Water Commission (IBWC) is charged with addressing issues that arise during application of binational water treaties. The IBWC is a binational entity with a U.S. Section that operates under foreign policy guidance from the U.S. Department of State. Under the binational 1944 Water Treaty, disputes and new developments can be resolved through agreed-upon interpretations of the treaty, called minutes. Mexican-U.S. relations generally grew closer during the George W. Bush and Obama Administrations. Water sharing was addressed through IBWC technical meetings and bilateral talks between government officials; these meetings and talks were the primary forum for addressing treaty compliance and frustrations of water users in Texas with Mexico’s water delivery regime. Treaty minutes were used to enhance bilateral cooperation and provide flexibility in how treaty compliance was accomplished. 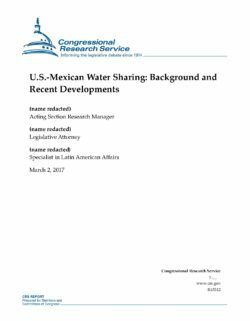 It remains uncertain what principles will guide and what mechanisms will be used during the Trump Administration to address water conflicts and what role enhanced cooperation (e.g., measures similar to recent binational efforts in the Colorado River basin) may play in U.S.-Mexican water sharing.